I picked up a DDM silencer from Dave's deal of the day for $17.99. They also had the carbon fiber version for $6 more, since they both did the same thing I just went with the cheaper one. 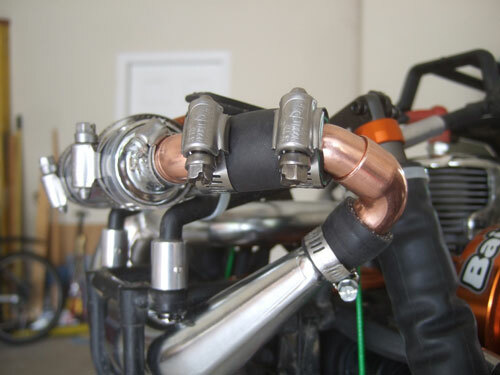 I got some ideas about running copper piping from another HBF member. The only problem is how do I keep the copper piece connected? I can not use solder because it will melt if it gets too hot. I went to Home Depot to see what are are my option. I started chatting with a HD employee about what options I had to connect and seal the pipe fittings. And he suggested using epoxy, they has some special copper epoxy for $5. But I already have a tube of general epoxy at home, so I decided to try what I have first. This was the same stuff I used to glue the screen to my engine case, so I know it will with stand the engine temperatures. 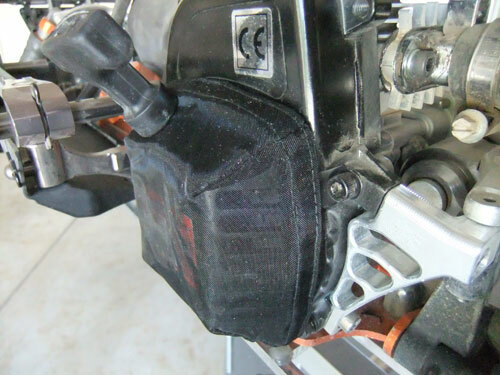 The epoxy should able to withstand temperatures over 300 degrees F.
I used the 3/4 heater hose to connect the 2 parts as a dampening. Because I am pretty sure there will be a lot of movement why the Baja is moving. 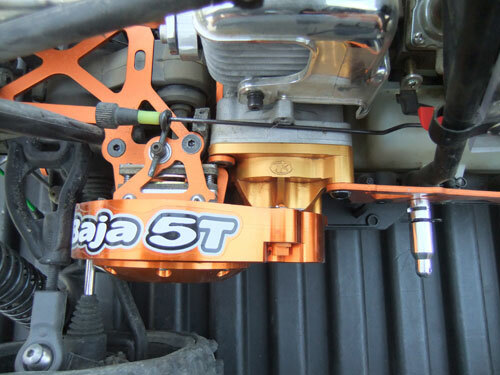 Here is a comparison between a stock clutch setup and Turtle Racing HD setup. 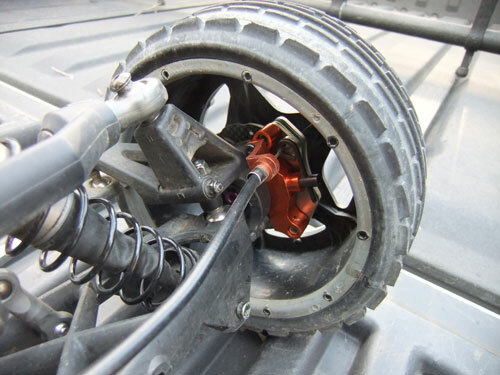 Correction, it's more like a comparison to my old setup to Turtle Racing, because I have an upgraded KM enclosed clutch holder. 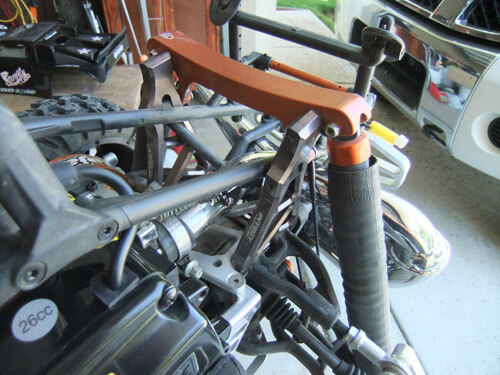 Whereas the stock is an open plastic brace. 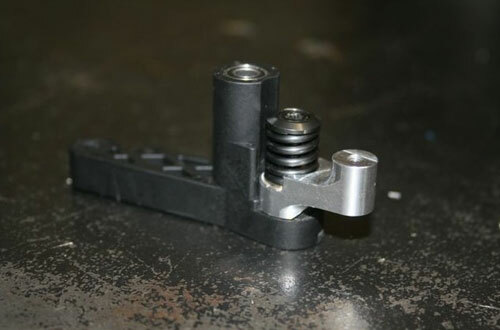 The main reason people upgrade to the TR setup is because the bolt that holds the pinion gear tends to break. Especially when a more powerful engine is used. 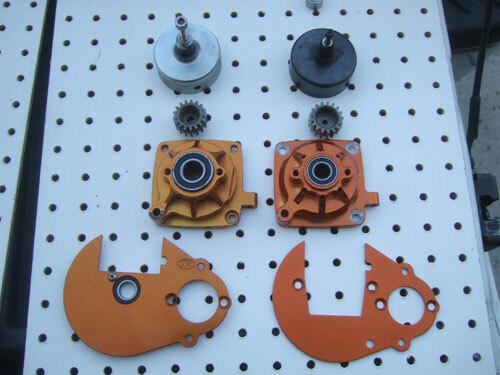 Not only the shaft of the gear, screw and bearing is larger but the spur gear holder bearing is build in to the back plate. 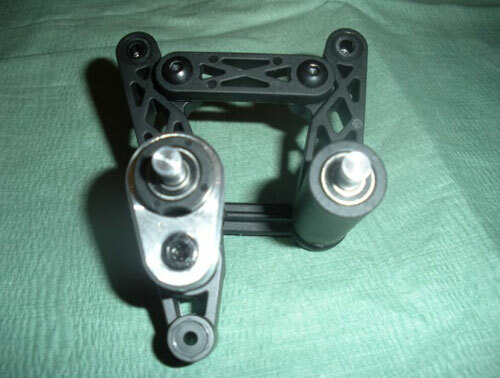 I also got in the mail today a GH front shock tower made from 6061-T6 Billet Aluminum and FFR aluminum side body post. 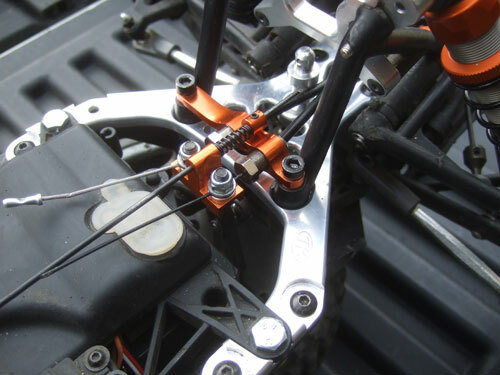 First the Turtle Racing 5T HD top plate from a guy through hpibaja.com for $25 shipped. I know the 5T and 5B plates are different but this makes it even better, so in case I wanted to convert it to a 5T I am good to go. Plus I do not need to do anything special to make it work on my 5B. and a bunch of misc parts. 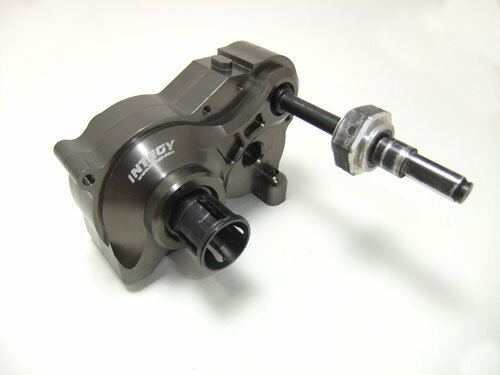 I was very surprised to see that the the integy disc brake set was complete and had everything I needed to install. 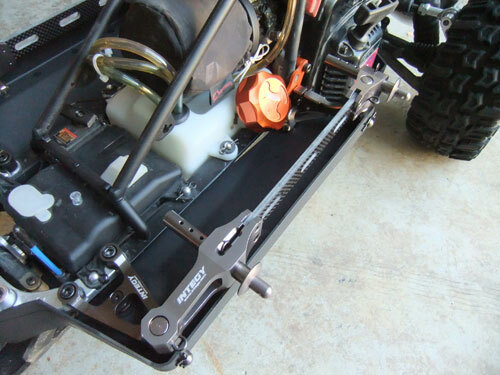 Same with the Turtle Racing HD clutch setup, It came with everything I needed. 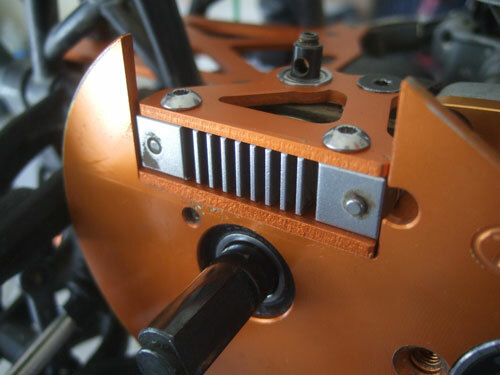 And the integy gear cover fit perfectly on the TR system too. 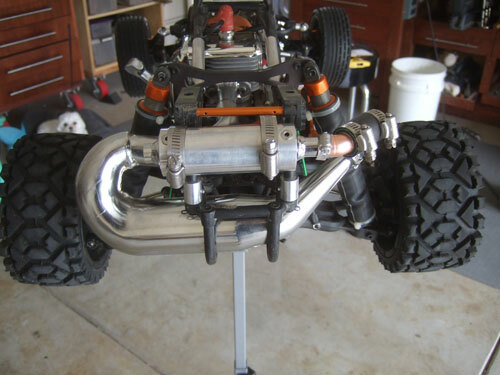 I am not a big fan of most of the tuned pipes out there mainly because it would make it a lot louder than stock, but I could not pass a good ebay deal either. While surfing on ebay for cheap parts I came across a few auctions by Dave's Discount Motors selling defective pipes. They had a black side mount Dominator, and a chrome rear mount Dominator with mounting tabs welding at the wrong place. 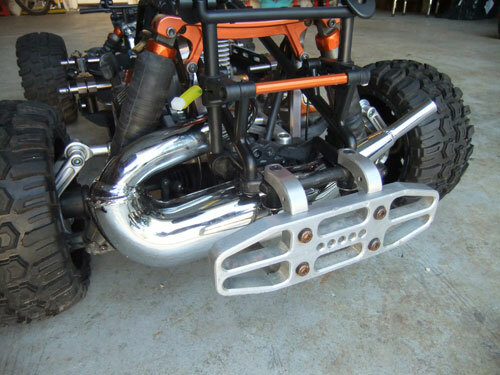 As you will see in the pictures I bid and won the rear mount chrome pipe. When I got the pipe in the mail I also noticed that it did not come with the X-port and mounting hardware. 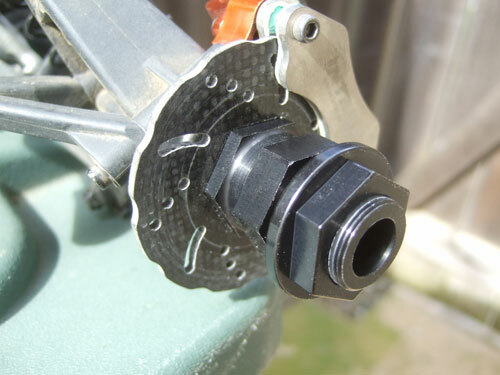 The X-port is a spacer that pushes the pipe a little further back so it will not rub against any plastic parts and reduces exhaust header temperature. Without the spacer the pipe would not reach the engine, so I had to make my own spacer with .313 inch thick 6061 aluminum. 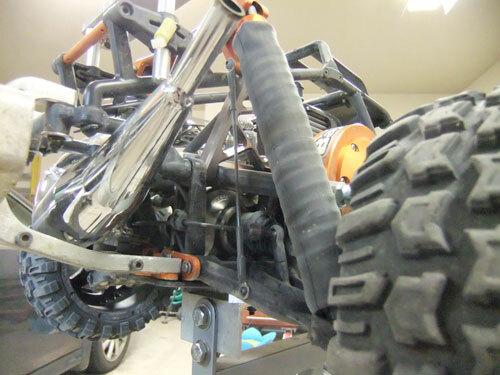 Other than installing a faster engine, the dominator pipe has made the biggest changes in performance. For sure the new pipe is a lot louder than the stock pipe, but the added power and speed is well worth the extra noise. 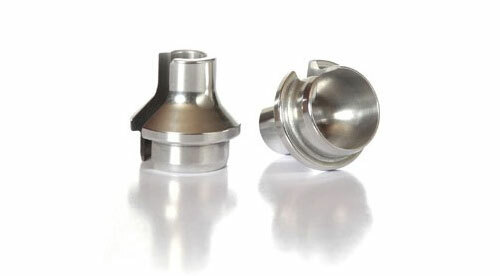 I think I might try using the DDM silencer and see if it would muffle some of the noise without the loss of too much power. I could not justify paying the premium for Outerwears pull start cover so I picked up a cheap GPM cover from ebay for $5. As you can see in the picture It fits very well and looks great too. UPDATE: The GPM pull start cover works great. After a few months the cover did tear while I was driving it. Since it was always exposed and not covered by the under guard or body I think the Outerwears version would have tore too. It looked like a hit a rock or something because it was a clean cut. I ended up going to GPM's website and bought 6 more sets for $24 shipped. I am pretty sure that would last me a while. 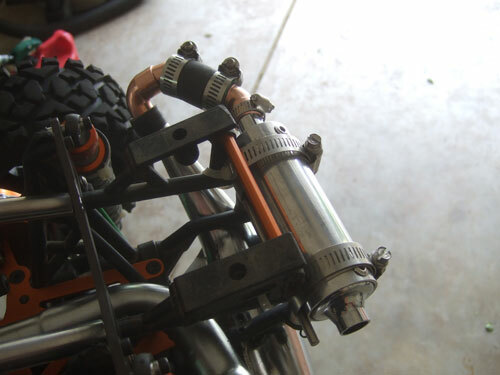 The dark soul wheel extenders was more of a cosmetic upgrade to me, because I did not really have too much problem with the buggy flipping over or wheel rubbing. Not to say it did not make difference on its stability, I really did not need to have it at the time. 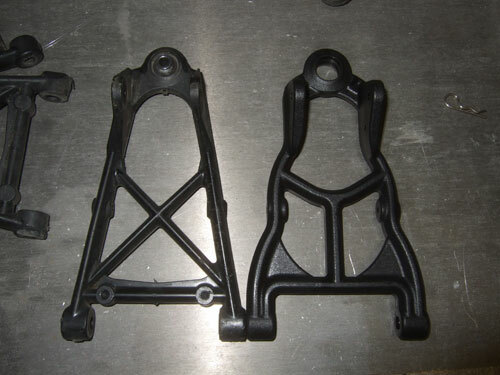 On hpibajaforum.com they have area within the site where manufacture have free drawings. I was lucky enough to guess the correct number and won a billet coil spacer, exhaust cover, and intake cover. 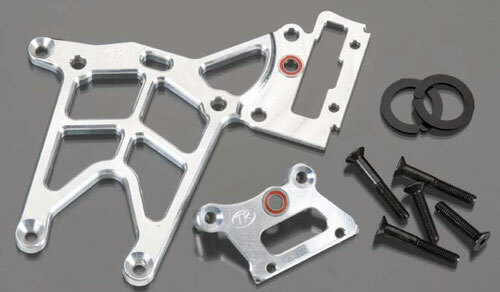 Then he offered to sell me pair of Overkill Concepts Front Upper Heim Kit at a discounted price. So far all their stuff works great with no slop on the upper front arm. 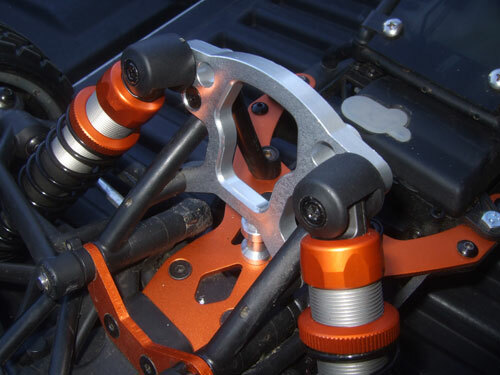 Like with all my RC cars I like using RPM arms, so I did the same for my baja too. 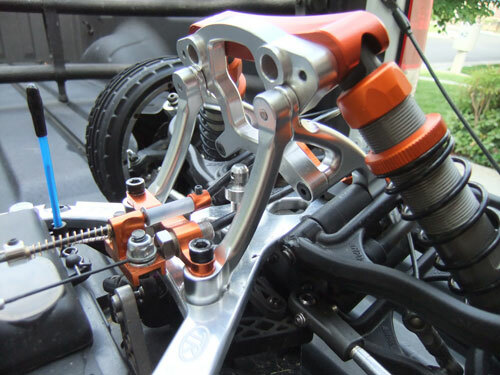 I like the looks of aluminum parts they are not worth the benefits verse the weight, cost, and durability. 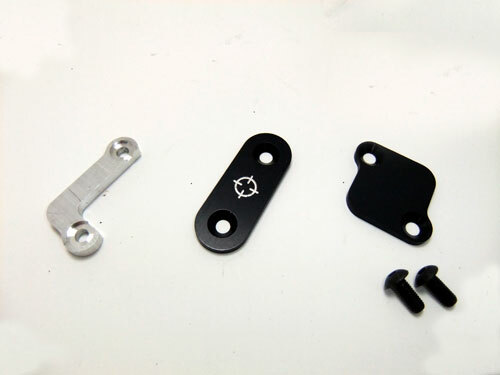 How can you beat the lifetime warranty on the RPM arms. 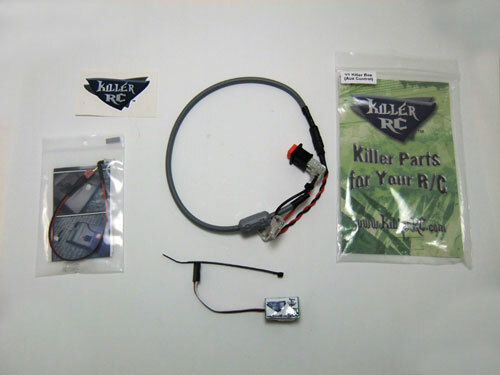 Even though the picture below shows a brand new Killer Bee Failsafe that is similar to what I have in my Baja. I did buy that kit from Killer RC but traded it for something else. 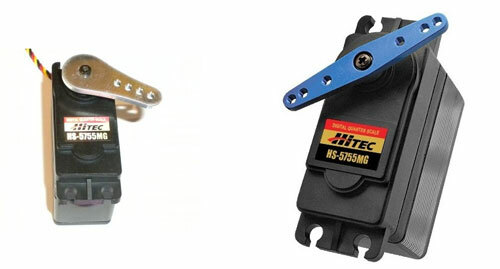 The only difference between that kit and mine is that is do not have the jst quick connect and EMI filter. 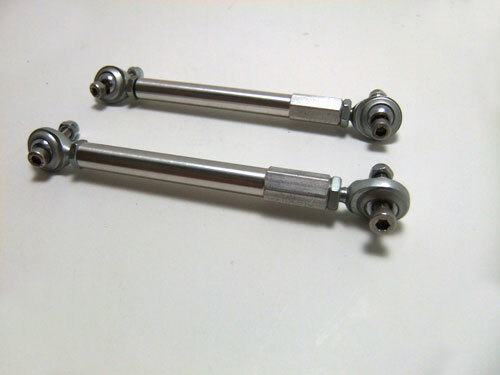 I won this brand new set of front and rear Kraken-RC Titanium Super Shock Shafts from a hpibajaforum.com contest. This set of shock shafts would have cost me $120 if I bought it from DDM. 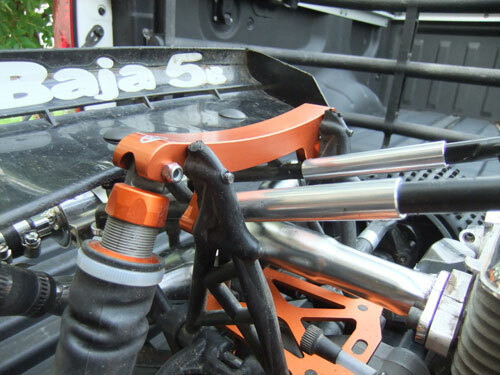 Since I bought a brand new set of 6mm baja SS shock kit I thought it would be a good time to install the Ti shock shafts. 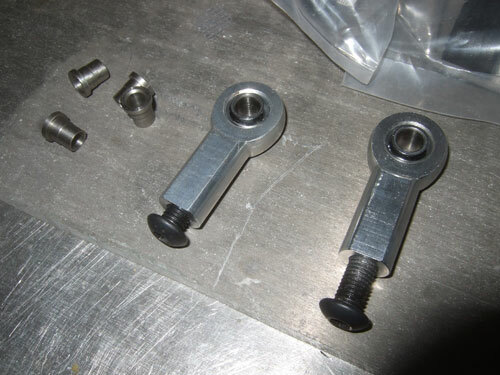 The picture below shows the stock shafts and the left and Ti on the right. I was badly needing to upgrade my turnbuckles because they kept bending and had too much slop in it. 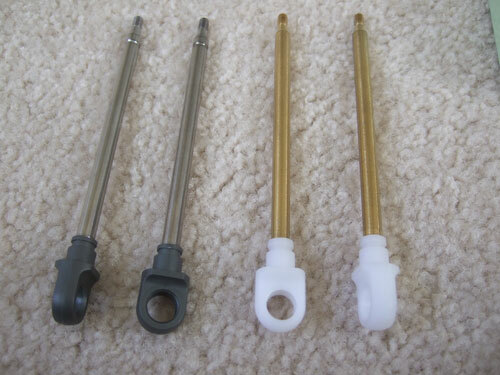 Then I came across a set of IRP Front Turnbuckle kit with standoff spacers on ebay. Needless to so I won that auction and now very happy with the purchase because the slop in the turnbuckle is now gone. The IRP turnbuckle has taken a lot of abuse and yet to bend. 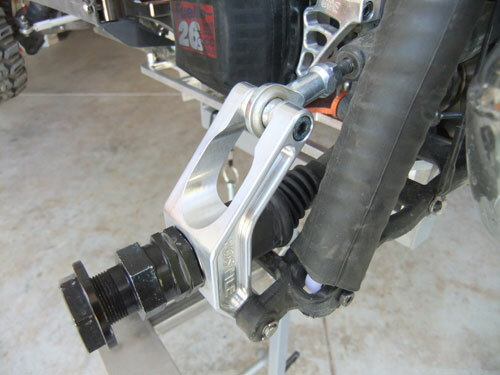 Here is another upgrade that is well worth the money because it is much stronger and faster than the stock steering servo. Please this servo is digital too. I came across a crazy deal on ebay with a retail value of $500 and got it for $100 shipped. I sold 3 of the 7 items for about $75, so that would mean I paid $25 for a Aluminum Transmission case, Alloy side rail guard, Carbon Alloy side , and rear shock support. I don't know about you but I think that is a great deal. I found a set of brand new Hostile 3 degree rear hubs for $55, then I got the matching Hostile Heim end conversion from DDM for $20. 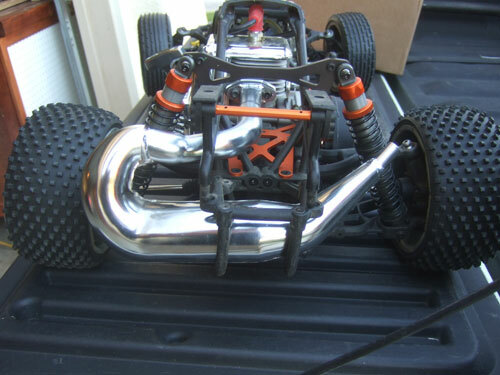 I also picked up a used DDM Dominator v2 pipe for $70 and he even threw in a Modified RC rear bumper for free. 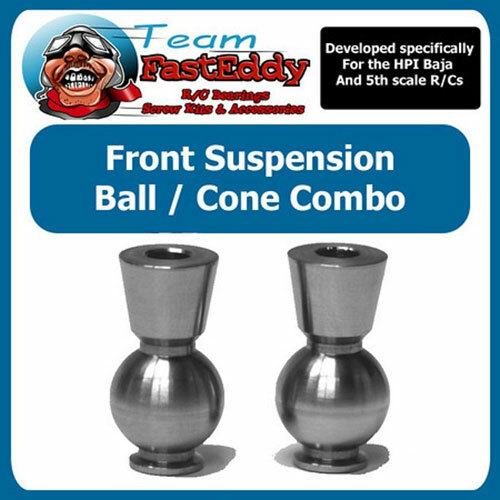 I got these ball/cone combo as part of a RPM arm set I bought. 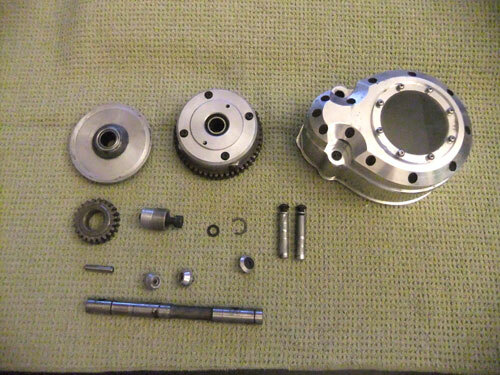 I finally got a Baja Skunkworks 2 Speed (23/ 51 gearing) and a Python Motorsports Billet Aluminum 2-Speed Gear Cover. So my initial trade was for the BSW 2 speed for $150 and the Killswitch. After talking with him over the phone he told me he has a PM Aluminum cover too. I was able to work out a deal to trade him the IRP Front Turnbuckles, Steel Front Rod Ends, and Radio box for it. I threw in the spur gear holder because he said he needed one. The gear cover goes for $150 at DDM so this definitely same me a bit. All the parts I trade was initial for the 2nd Baja 5B I had, but I traded it before I got most of these used parts in the mail. Since I already had all these parts on my 5T, why not sell it or trade it for something different. I though these cups looks cool and DDM has it on sale for $7.50 a pair so that is why I bought 2 pairs of them. After buying 2 used RX packs that failed on my I finially learned to only buy new battery packs. 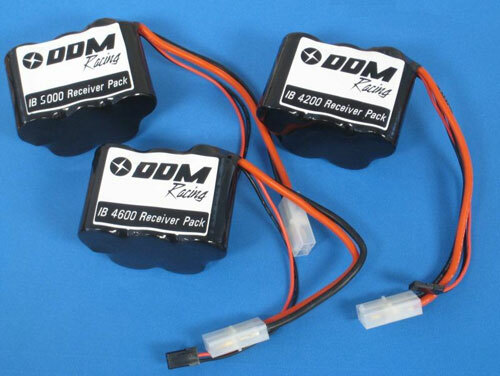 This was another DDM's deal of the day, 5000mah NiMh for $29.99. The failed battery packs that I bought worked fine at first, then all of the sudden one of the cells just died. One of the packs was a Killer RC LiFe RX battery too. Right after Baja Fest OBR had a huge sale on their engines. At first I was planning to go all out and buy the 27.2 full mod long rod engine. But the problem is the cost of those engines. I just cannot see myself drop over $500 for an engine, that is not including tax to (they are located in CA). So I picked something a little more modest, with the option to upgrade later. 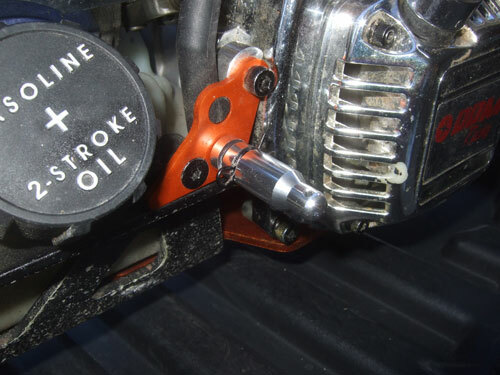 They have a program where you can send the prostock engine back to them and pay $250 to upgrade it to a Full Mod Long Rod which pushed it from a 5.5hp to 7hp. 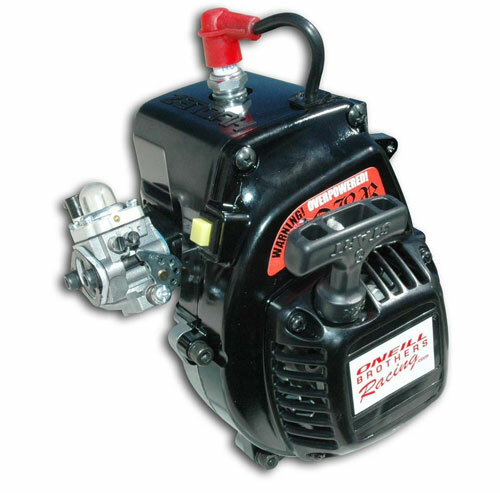 So for now $349 for a OBR Prostock Zenoah 30.5cc engine is not too bad.